One of the most interesting design elements is the visible escalators poking out the side of the building. Back in 2013 at the Korea-Mongolia International Dinosaur Project Symposium, Tony Fiorillo gave a really interesting presentation on the design of this museum, and talked about how a lot of people never make it off the first floor of a museum, which is also usually where the dinosaurs are. 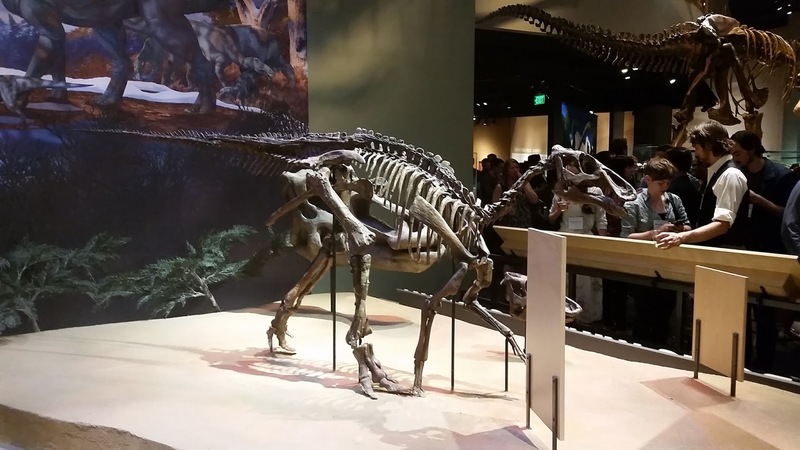 So at the Perot Museum, the dinosaurs are on the top floor and you are immediately shuttled upstairs (it’s actually kind of hard to *not* go to the top floor first! ), and then you work your way down the museum to exit. 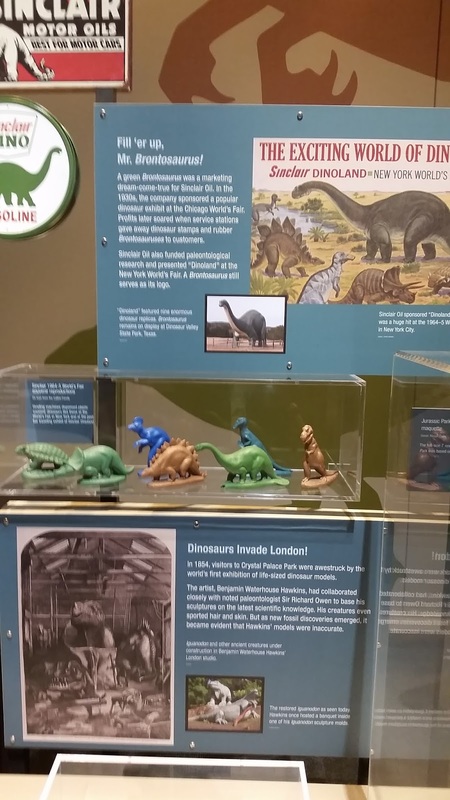 The dinosaur exhibits feature some interesting species that aren’t found in a lot of other museums – here’s a modern take on Tenontosaurus, and the still unnamed Proctor Lake ‘hypsilophodontid’ (somebody name that guy, already!). My favourite exhibit in the whole museum! 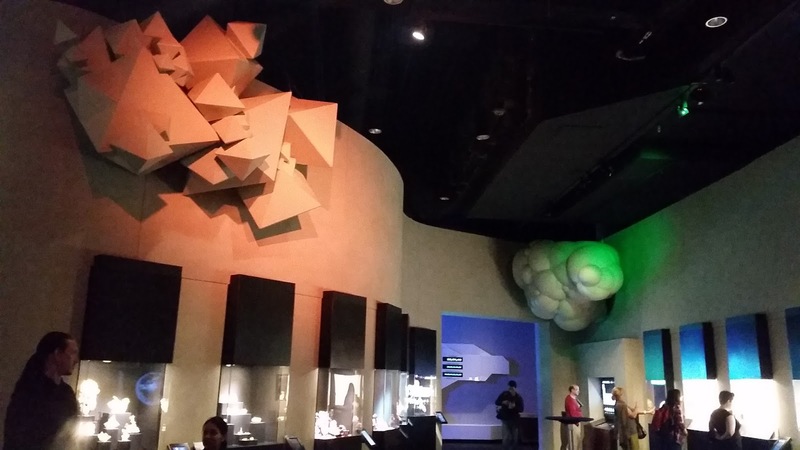 One of the only places where I’ve seen the North American-Asian faunal interchange visualized in an exhibit. Tarbosaurus is in Asia, and its close relatives are in North America (I can’t remember exactly which taxon is featured here, but perhaps it is Bistahieversor based on its geographic position?). 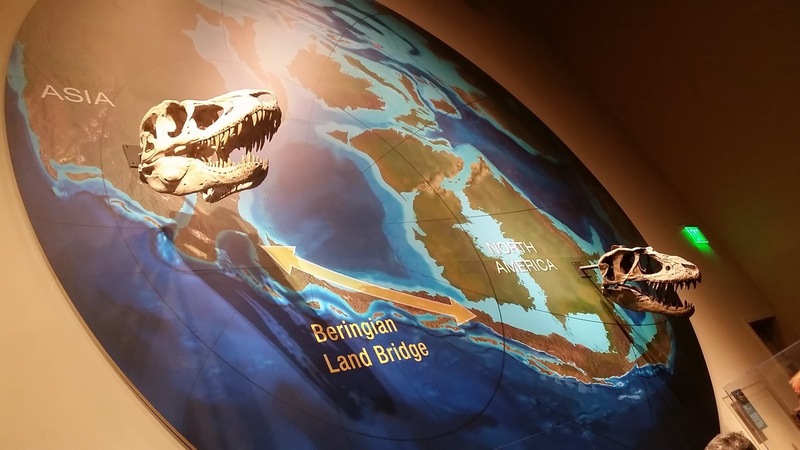 Also whoa, Beringia sure looks strange from this polar vantage point. 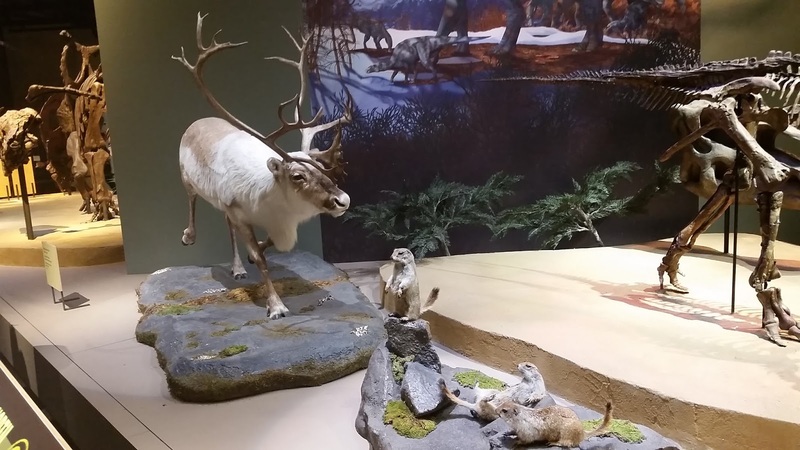 Another interesting thing the museum has done is to place modern animals alongside the dinosaurs for comparative purposes. 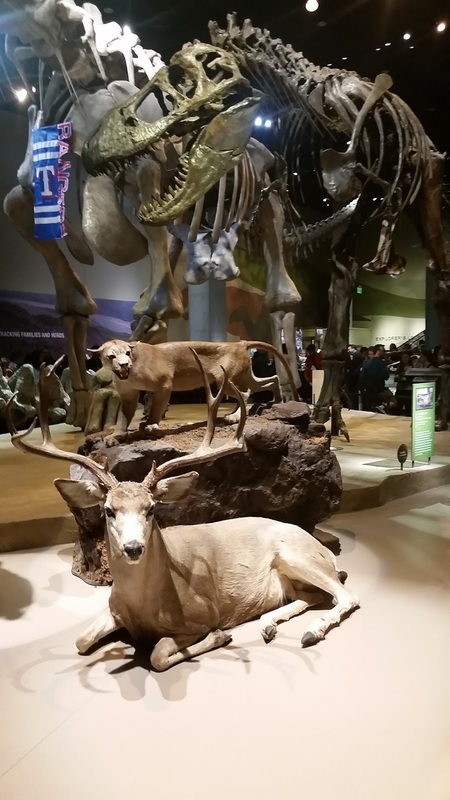 Here we’ve got predators and prey – a mountain lion and a deer, and Tyrannosaurus and the sauropod Alamosaurus (off to the left of my photo). …and its extant analogue the caribou (Rangifer!). I wasn’t totally sold on this approach, but I was intrigued by the mixture of extant and extinct, and of modern and ancient ecosystems, so maybe I just need to ruminate on it a little more. I’m a sucker for Sinclair dinosaurs, what can I say. 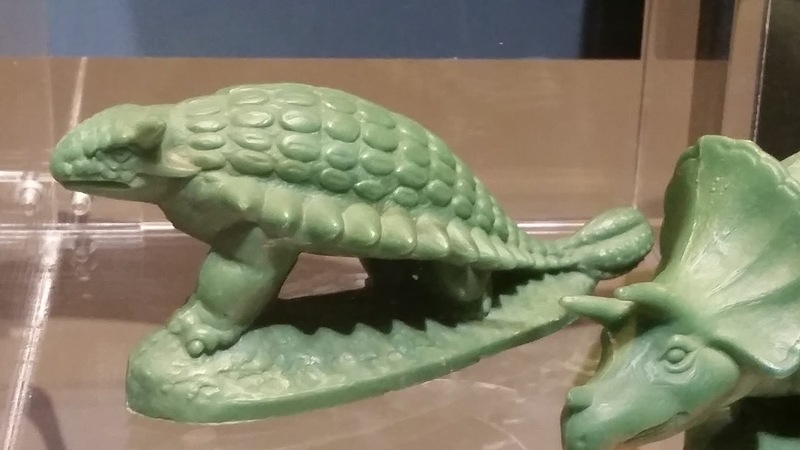 Does the mould for the Ankylosaurus exist anywhere still??? DO WANT. 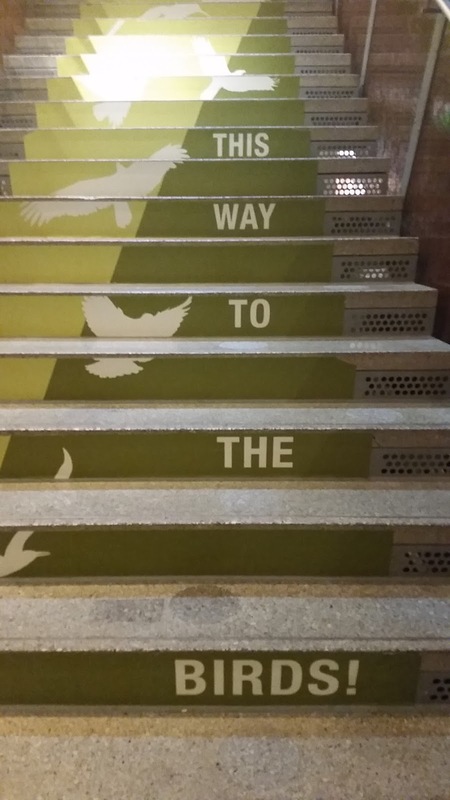 At one end of the dinosaur hall you take a set of stairs up to the bird exhibit! I liked this a lot, both because the bird exhibit had some cool interactive stuff, but also because I like the symbolism and narrative structure to traveling upwards towards birds from dinosaurs – it’s like moving up the phylogenetic tree, and gaining flight. From up in the rafters, you get a nice view of the dinosaur gallery, and a great vantage point for examining the gigantic Alamosaurus (real vertebrae are tucked down at ground level behind the skeleton from this angle). 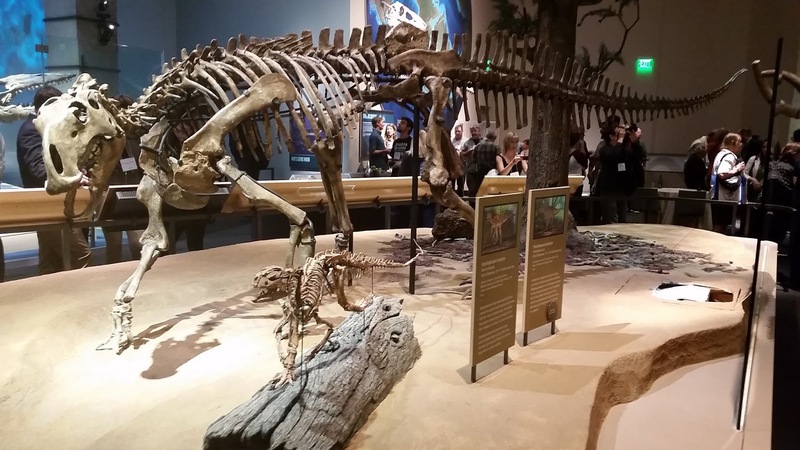 Alamosaurus is a weird and biogeographically interesting creature, representing a re-emergence of sauropods in North America after a lengthy hiatus throughout much of the mid Cretaceous. 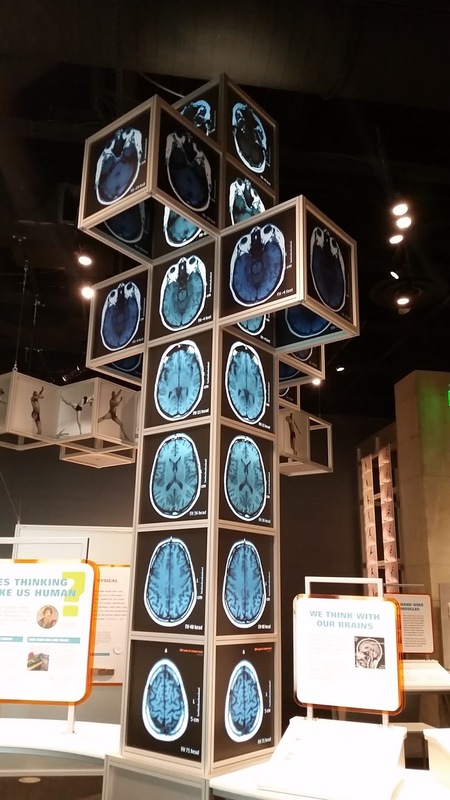 Brains! There’s a really fun section on medicine and human anatomy. Phylogenies! 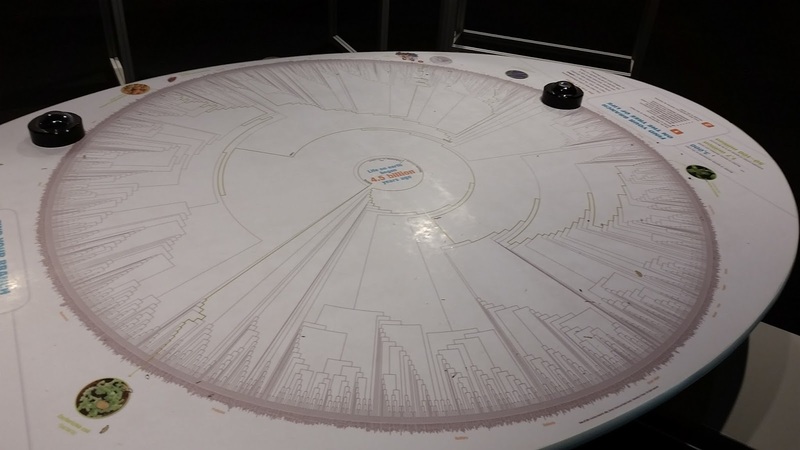 Can you find where humans are located on this giant tree of life? 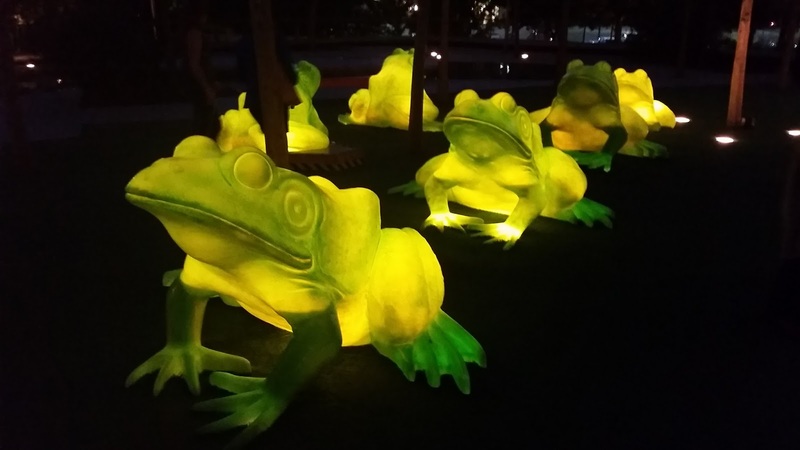 Outside the museum, we were bid farewell by these very fine green leapfrogs, which surely must be great fun to play with if you are smaller than I am. More Texas adventures forthcoming – stay tuned!